"Audit wireless networks for checking their security and decoding passwords of WiFi"
Having a peace of mind on the internet is important to all users. If it isn’t important, then you’re probably one of the people that this application serves to enhance your protection against, hackers. I’m not talking about the hackers that you may have seen in the Watch Dogs video game that recently released and created quite a frenzy. Although for these hackers, hacking is almost as simple as clicking a button on a cell phone when it comes to gaining access to your home network security if your router has not been properly set up and properly secured. How do you know whether you are safe or not? Wifi Auditor aims to aid you in getting that answer. 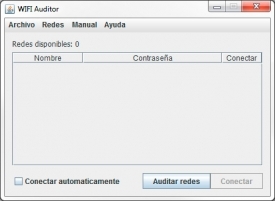 Wifi Auditor works because it knows the base security flaws that accompany routers when they are first shipped to your home or purchased from your local electronics store. It knows how the base passwords are determined and if you are one of those people that just like to tell your guests to login to your router by reading off the password on the bottom of the router, you are in a bit of trouble. Especially if a hacker is running a simple program like Wifi Auditor. Wifi Auditor serves to help. It serves to aid people in determining whether their network is secure by attempting to break in to their own network. This is risky business though because an application like this, in the wrong hands or on the wrong hard drive, can have some extreme consequences. Because the application knows how to decipher your base password, with the click of a button a hacker can do the same thing. While Wifi Auditor does not save your router’s password to memory, once it detects that it has the correct password, it will automatically connect your computer to the “hacked” network. You don’t even have to be a hacker to know that once you’re connected to a wifi network from your Windows PC, you can connect again at any time and retrieve the password easily within a few clicks. Once your password is exposed, there’s no turning back. Unless you are notified from your router or some other third party application on your Windows PC or smart phone that someone has connected to your network, you will never know. Hackers can easily syphon your data from this connection and use it against you and to their advantage instantly. The only solution is to create a strong password for your router that includes letters (in both cases), numbers, and symbols. With a strong, custom password, Wifi Auditor and other programs like it will not work. If you are having trouble creating a password that you feel is secure enough, you can use a password generator to generate one that is more secure. Please note, using Wifi Auditor or any application like it for illegal activities such as breaking in to your neighbor’s wifi is a crime and is subject to legal involvement. Only use this on your own network at home.